Bjerregaard is located on the west coast of Jutland and offers some big and spacious cottages with whirlpool, sauna and other treats. In Bjerregaard you will find ample opportunities for riding and doing other sports activities such as tennis and all kinds of water sports. Cottages in Bjerregaard are surrounded by some of the most beautiful nature in Denmark with dunes, heath and wood. Therefore cottages in Bjerregaard are in high demand. See the holiday homes in Bjerregaard on a map - click on the map! 125 m2 cottage with large light lounge with large kitchen. Suitable for 2 families, 2 masterbedrooms, 2 rooms with 3 beds and 2 bathrooms. Closed, partially covered terrace. 600 m to the North Sea. Discounts for horse riding 5 km away. 10 persons Dishwasher Washing machine Whirlpool Sauna Woodburner Pets OK Distance to beach: 600 m.
Lovely cottage for 4 people 250 m from the North Sea and beautifully situated in the dunes on a 1700 m2 large plot. 3 undisturbed terraces to the north, south and east give plenty of options for sun or wind contactor. 4 persons 2 bedrooms Internet - Broadband Pets OK Distance to beach: 250 m.
Luxury house with WIFI, suana and spa on nature site, just few minutes from the beach. The house is surrounded by a large partially covered terrace. 3 bedrooms. Final cleaning 88 Euro. Changeover day Friday. 6 persons Dishwasher Washing machine Whirlpool Sauna Woodburner Internet - Broadband Distance to beach: 500 m.
Vesterhavsbo - Lovely and modern cottage in Bjerregaard at Holms dune land with spa, sauna and internet. 6 persons 3 bedrooms Dishwasher Washing machine Whirlpool Sauna Woodburner Internet - Broadband Pets OK Distance to beach: 850 m.
Very nice cottage 100 m from the fjord, 700 m from the North Sea. Large light sitting room with kitchen. 5 bedrooms with 10 sleeps + 4 on loft, 2 bathrooms, remodeled in 2010. 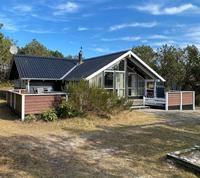 Natural plot, 500 m to the riding center, 5 km to Hvide Sande. Quiet area. 10 persons Dishwasher Washing machine Whirlpool Sauna Woodburner Internet - Broadband Pets OK Distance to beach: 600 m.